Warner Bros used to rule the cartoon roster with the endless amount of Looney Tunes characters and shorts, but when it comes to their films they also used to crash and burn, at least at the box office (the financial disappointment of The Iron Giant due to the studio’s poor promotion for it is now legendary). But things started to change when the Warner Animation Group, or WAG for short, was formed in 2013, with a “think tank” that included directing duos like Phil Lord and Chris Miller, and John Requa and Glenn Ficarra, as well as other talents like Bad Neighbours and Forgetting Sarah Marshall director Nicholas Stoller. The first film that headed out their gate was none other than The LEGO Movie, a product tie-in movie that was so good that furore was raised when it WASN’T nominated for the Best Animated Film Oscar. While their second film Storks, written and co-directed by Stoller, never reaches the heights nor even the standards set by The LEGO Movie, it is further evidence that WAG is not only making wholesome family entertainment that Warner Bros hadn’t been making in years, but are making them seriously, SERIOUSLY funny at the same time. The set-up here is that storks, after eons of delivering babies as is the ancient myth, are now instead delivering packages for internet conglomerate Cornerstore.com, with the (ahem) baby-making process eradicated from the company’s policy. One stork, named Junior (Andy Samberg), is being eyed for promotion by his power-hungry boss Hunter (Kelsey Grammar), as long as there are no major screw-ups on Junior’s end – which is inevitably what happens, when Junior and the company’s sole human employee Tulip (Katie Crown) accidentally make a baby girl (AHEM) and must now deliver it to her family before anyone finds out. From there, they must outmanoeuvre a pack of wolves as well as a scheming pigeon that has Donald Trump’s hair for some reason, if they are to deliver the baby safe and sound. Even though it may seem like a standard Three Men and a Baby-type scenario, how Stoller and the imaginative forces at WAG have managed to execute it with their endless amounts of energy and vibrant senses of humour is quite frankly astounding. It genuinely feels like a lost Looney Tunes cartoon half the time, thanks to the animation which is so energised and fast-paced that it fits right in with similar cartoon laugh riots like Genndy Tartakovsky’s Hotel Transylvania movies, while also containing a certain style that definitely calls back to Chuck Jones and Friz Freleng’s respective designs for some of animation’s most iconic characters (the wolves, for instance, look like lost cousins of Wile E. Coyote, but more on those standouts later…). Watching it, you can definitely feel the child-like giddiness of Stoller and co-director Doug Sweetland just leaping off the screen, like a couple of kids who are experiencing the greatest sugar rush of their lives, and even if the story and where it is destined to go doesn’t always leave much to the imagination (you can probably tell exactly where this is all headed from the first ten minutes), what Stoller and co have drudged up and visually put on screen certainly does. They seem to have especially put all that energy and enthusiasm into the wolves, who are by far the best part of this movie. Imagine if Wile E. Coyote had somehow cloned himself multiple times from yet another ACME product, and could then use those other clones to basically become a Transformer; that’s basically the wolves in this movie, and they are just as hilarious as that sounds. I don’t even want to really give away some of the stuff they end up turning into, because half the enjoyment of the gag is the unpredictability of what they are actually capable of, as well as the sheer creativity and, of course, the absolute hilarity. Helping matters too is that they got none other than Keegan-Michael Key and Jordan Peele – aka Key and Peele – to lend their voices to the leaders of the pack, and if you know their sketch show or their recent theatrical outing Keanu then you will probably know that they know exactly how to bring the funny, and they definitely do that here. There’s just something about their line deliveries here that just crack me up every time, and I think it would take a real steely heart for another adult to not at least smirk at these characters and what they end up doing. They tend to overshadow some of the more prominent characters, but luckily they’re fine on their own as well. Samberg does his usual Andy Samberg performance here, which is something I am cool with because I actually like that typical performance anyway (it’s kind of like Adam Sandler if he were actually funny). Like most of the rest of the world, I never really heard of Katie Crown, the voice of Tulip, before this film, but upon discovery that she’s been a prominent voice actress over the past few years in things like Adventure Time and Bob’s Burgers, I am grateful to the filmmakers for not casting a more known actress in her stead, and went with an actual voiceover artist who turns out to be extremely funny and charming in her own right. Kelsey Grammar also gets some funny moments as the brash and psychotic Hunter, and although it was probably the Trump-haired pigeon character, named Pigeon Toady (played by another voice actor, Stephen Kramer Glickman), that I felt the most unsure about, mainly because I had no idea what his main deal was, I’ll admit that there were a couple of times that character cracked me up, just because of the bizarre ways that Glickman was delivering these lines. Jennifer Aniston and Ty Burrell also show up as the parents of the young child who asked for the baby in the first place, and while I’m not sure why they were brought on board virtually at the last minute (aside from their obvious star power), I thought they did fine. When it comes to animated comedies this year, Storks is definitely one of the funniest, and while it’s not the best of them (I personally thought Zootropolis was a better overall movie), it’s one that should get both kids and adults rolling on the aisles this half-term. 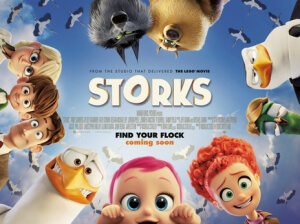 Storks is a hilarious animated comedy that delivers with each and every one of its jokes, particularly those surrounding the wolves, and while the plot might not be anything new it doesn’t distract from its charming Looney Tunes-style humour.